Call it vendetta politics or plain stupidity, the crisis in Karnataka politics which finally seems to settle down for the time being has to be ensured of not repeating itself. Neither of the party, namely H.R.Vardwaj or B.S.Yeddyurappa can either be blamed or given a clean chit for the mess that was created; as many would suggest, best should have been avoided. Even if at the face value it may seem like two individuals are at loggerhead, it certainly has got more than just individual egos. A lot of political gain, self-achievements and last but not the least a good amount of arrogance was there or there about in the whole farce. First look at H.R.Vardwaj’s interest. He is supposed to be the governor of the state and a person appointed by the President of India to ensure smooth running of the state government. Well that is what the job profile of any governor of any state anyway. When someone says smooth running of the state government, it inherently means the stability of the state politics. So in other words the governor is the person who is responsible for a stable government in all possible scenarios (unless something goes seriously wrong) and should be his/her primary lookout. Here I feel Varadwaj failed miserably. He not only went beyond the Do’s & Don’ts but also tried to work the other way. More than once he showed his interest to destabilize the government with the help of the plethora of constitutional tools available at his disposal. This is surprising for many, including me. I am no constitutional expert to agree or disagree on whether Varadwaj was right in availing all the democratic tools at his possession to destabilize an elected government or not. While he might be constitutionally at no fault for such an exercise of power, the experts believe he walked a little too far. Traditionally the post of Governor in India is a celebrated position and many believe a retirement home for veteran politicians. This idea of employing veterans has its own advantages. The primary advantage is that of neutral behavior and unbiased approach to state matters. The people at such high offices do see this post as a reward for their active political contribution to the party at center and an honor to be addressed as ‘His Excellency’ before they could retire from active politics. As obvious, at the verge of retirement the person might not have further political strides to make and would love to bid adieu to his political career untainted and on a high. This is what many feel Varadwaj breeched by his acts and actions. But can we really blame entirely Mr.Varadwaj for his actions? Can’t there be an unseen hope of returning back to active politics by remaining in the good books of the party high-command? Look at the curious case of S.M.Krishna. When many thought his political career is at the fag end being the governor of Maharashtra, the general election of 2009 did change the equation. To surprise many including Mr.Krishna himself, he was given the all-important portfolio of External Affairs minister. This could be termed as a mistake. Not because Mr.Krishna is incompetent for the post or anything like that. The sheer manner in which a bad precedence was established should have been avoided. The once coveted and prestigious retirement home called Raj-Bhawan turned into a political forte at once. Rather being neutral the appointment of Mr.Krishna served as a lease of new political life for many. The post suddenly seemed like a bouncing pad to renew one’s political career. So those who thought they are almost down and out in their political journey the appointment served as Oxygen. And what better you can do to bounce back than keeping yourself on the good books of your high-commands. I am not saying Varadwaj might have harnessed the idea I am mentioning but at the same time I won’t be surprised an ounce if he actually would have. This might not go down well with many, but I feel there is more to the chaos than just corruption and graft charges, nepotism, manipulation of democratic framework as accused by Varadwaj in his recommendation letter to the GOI in favor of president rule in the state. We can’t throw one of our states to mid-term poll for no solid reason. Can we? Not to blame Varadwaj alone, Mr.Yeddyurappa has his share of pie to contribute to the mess. The party which claims itself a party with a difference doesn’t seem to walk the talk. To begin with, Reddy brothers and their tired with corruption did left the Karnataka government and BJP at large high and dry. The mining mafia that congress always accused of Reddy brothers hobnobbing with might have some truth to it. An astute politician like Yeddyurappa can’t even deny the fact that there was some kind of grand scale loot going around Bellary mines eventually incurring heavy losses to the state and its natural resources. But there is a catch to what Mr.Yeddyurappa can or can’t do. When a top leader of his party and of the stature of Mrs.Sushma Swaraj represents the constituency and alleged to have close links with the Reddy brothers, one always can guess what action as a Chief Minister one can take. I am not saying this should be the reason to shy away from corruption and look the other way. But at the same time should not be seen defending violently the individuals in question. 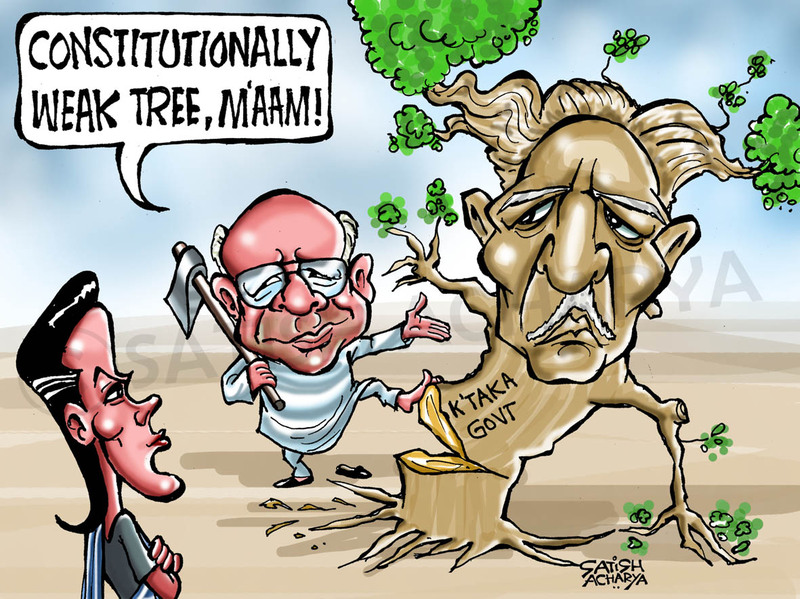 The position of Mr.Yeddyurappa is further diluted by his own acts too. The land scams involving his close family members didn’t help the cause a bit. The unfortunate theatrics post the breakaway faction of BJP MLAs is certainly an embarrassment for our democracy. More surprising is the manner in which the speaker of the assembly disqualified the faction on the no-confidence day. Without any doubt whatsoever, it was wrong. While the argument on whether the behavior of the speaker was right or wrong can go on for ages; little did the actions of Mr.Varadwaj then can ask for any credibility either. A governor has got no business to write letters to the speaker on how he should maintain the decorum and process on the floor. The speaker is supposed to be qualified enough to know what precisely is expected from him and any interference in his work should not be entertained. 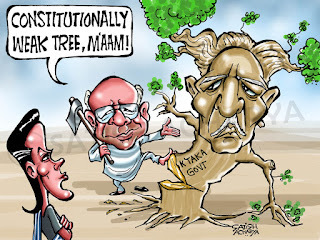 But sadly ethics and democratic functioning was shown the back door and amidst a lot of chaos and TuTu-MainMain Mr.Yeddyurappa survived as a chief minister by the skin of his teeth, while the whole voting saga many claim as undemocratic to begin with. Let’s not get there as it is the lookout of the speaker of the house to decide. But little did the mellow down of the situation in Karnataka gives any comfort. It more seems like a sleeping volcano which can erupt at any time with more unpleasant scenes following the suite. The order of Apex court to reinstall the sacked MLAs or the suggestion of the governor to impose the president’s rule can’t stop things going from bad to worse in the future. The political stability of any state is a closely knitted affair between the Raj-Bhawan and the state secretariat. More than democratic frameworks, it is the relationship between the shareholders at both sites which ensures a smooth running. But that closeness is far from happening in Karnataka till there is a change of guards, both physically and mentally. We can safely strikeout the mental compromise happening at either end as it is ego which always enjoys the last laugh. So what next? To have a smooth running of the government in Karnataka one either of Varadwaj or Yeddyurappa has to go. And I feel both have enough reasons to leave their post and allow the smooth functioning of the state machinery. But can we possibly ask Mr.Yeddyurappa to go? Will it be fair for a people elected government be sacked without any credible reason? Many who see there is a still middle ground would advocate for Yeddyurappa to step down as the Chief-Minister and a fresh face taking the charge. If media reports are to be believed, this is precisely the demand of those breakaway faction always has. Judicious suggestion but has to be figured out, how many takers are there for this option. While there is a possibility, the probability of this happening looks ridiculously thin. This leaves us with the sole option of asking Mr.Varadwaj to pack his bags; more so after he is snubbed by the GOI on his suggestions of President Rule in the state. But what is the probability of that happening? Not much since Mr.Chidambaram has clearly strike out this as an option. So in nutshell the turmoil in Karnataka which started some six months back doesn’t seem to recede anytime soon. Looking at the ultimatum that BJP has issued to the center to remove Varadwaj within next 5 days or to face a nationwide protest doesn’t give a pleasant feeling. First for, it may bring Karnataka again to the boil and second a political party can’t decide on whom to be there and who not when it comes to president appointed posts. Democracy at large is bigger and important than any party or individual. Be it Yeddyurappa or Varadwaj; BJP or Congress. Someone needs to educate a whole lot of people to refrain themselves from bringing personal problems to state governance and least at least – Allow the democracy to exercise itself. Till then let’s keep our fingers crossed and hope nothing unpleasant or embarrassing happens in Karnataka or elsewhere in future.